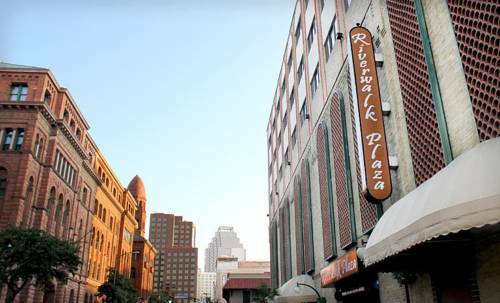 The River walk Plaza Hotel is a charming boutique hotel in the heart of San Antonio on the River walk. A wealth of amenities awaits guests such as our free high-speed Wi-Fi 24-hour Business Center and Lending Library. Enjoy freshly brewed coffee from our Coffee Shop top off the evening with a unique cocktail at the Bar. Enjoy a dip in our heated courtyard pool and soak in the sun or workout in out 24-hour fitness facility. The hotel is located on the southwest part of the River walk in the heart of San Antonio next to Main Plaza. The Alamo La Villita Market Square River center Mall and any other downtown landmark are only a 5-minute walk from the hotel. A River walk entrance is across the street from the hotel. The Alamodome is a domed 65000 seat multi-purpose facility used as a football basketball stadium and convention center. The Spurs played in the Alamodome for a decade and is now used for a variety of events such as UTSA football and NCAA tournaments. La Villita Historic Arts Village is an art community in Downtown. There are many fine arts galleries stores selling souvenirs gifts custom jewelry pottery and imported Mexican folk art as well as several restaurants in the district. Main Plaza was the site of the first authorized Texas city when it was established as the market square for San Antonio March 9 1731. Government structures still share Main Plaza with the Cathedral and the 1882 County Courthouse. The Alamo was originally known as the Mission San Antonio de Valero. It is a former Roman Catholic mission and fortress compound and the site of the Battle of the Alamo in 1836. It is now a museum in the Alamo Plaza District of Downtown. The River Walk is a network of walkways along the banks of the San Antonio River 1 story beneath the streets of Downtown. Lined by bars shops and restaurants it is an important part of the citys urban fabric and a tourist attraction in its own right. The Tower of the Americas is a 750-foot observation tower/restaurant on the southeastern fringe of Downtown. The tower was designed by San Antonio architect ONeil Ford and was built as the theme structure of the 1968 World's Fair HemisFair 68. The Henry B. Gonzalez Convention Center is located Downtown along the banks of the River Walk and is the central component of the citys convention industry. It hosts more than 300 events each year with over 750000 delegates from around the world. A three-block outdoor plaza lined with restaurants shops and produce stands near San Antonios city center Market Square is the largest Mexican market in the U.S. It is one of Americas top-ten outdoor markets according to Frommers. River center Mall is located on the River Walk and houses many shops and restaurants. With a large list ranging from Macys Sun Glass Hut Victorias Secret Bath and Body Works Gap Tony Romas IMAX Theater River center Comedy Club and so much more.